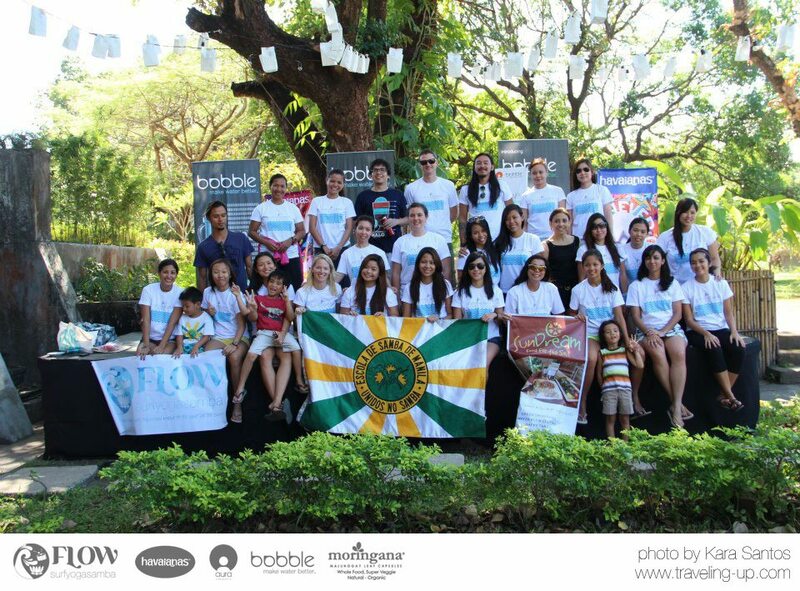 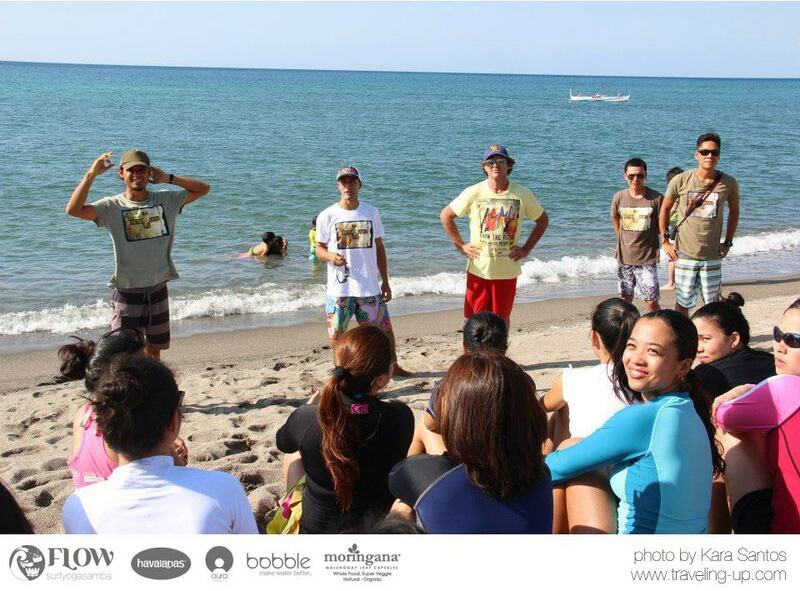 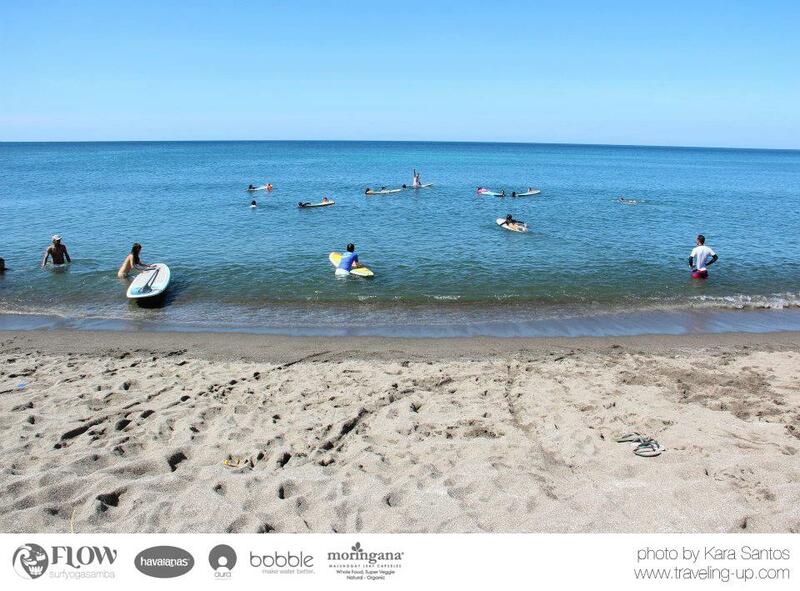 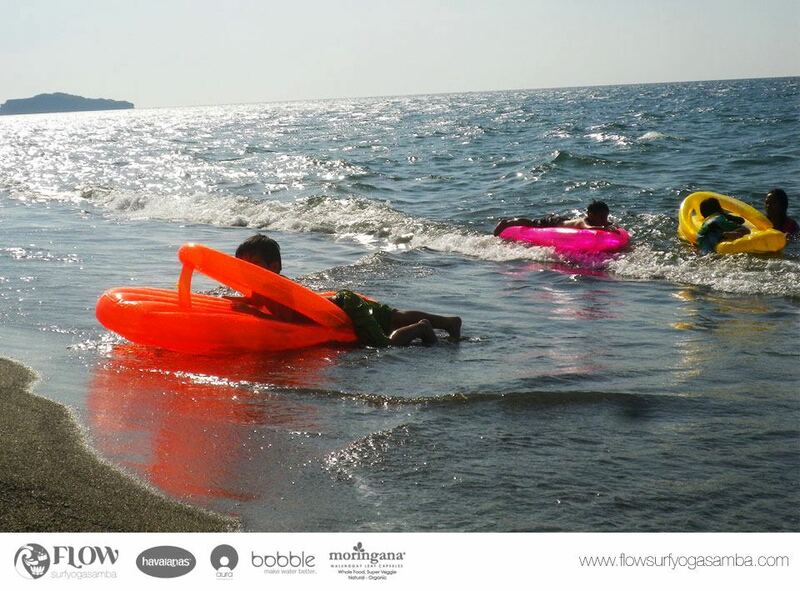 Flow:SurfYogaSamba Year 3 at Zambales! 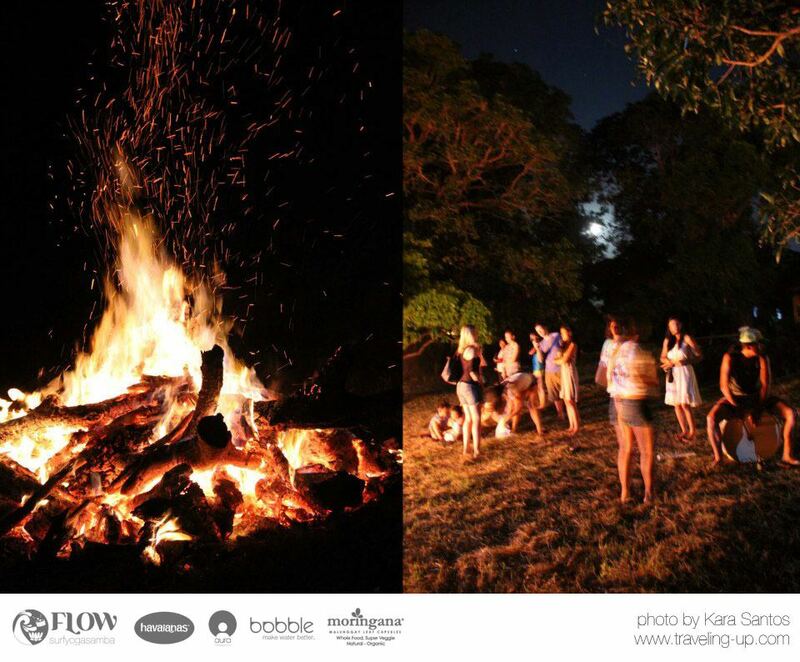 Choose to celebrate summer all year round with the FLOW team. 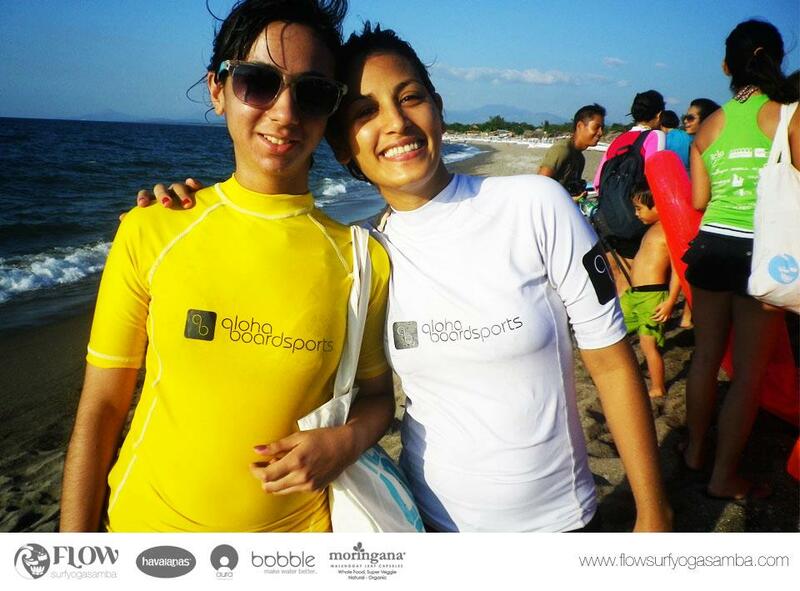 Grab some sun, sea, surf, asana and samba in different locations in the Philippines for one of your most memorable experiences! 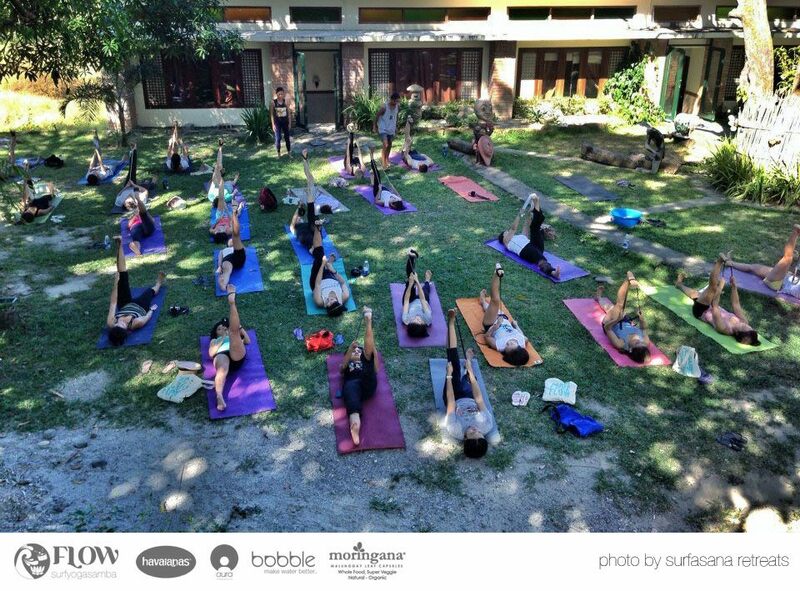 The annual FLOW SurfYogaSamba weekend retreat last November 30-December 2 was a special milestone as the team celebrated their 3rd year at Casa San Miguel, Zambales. 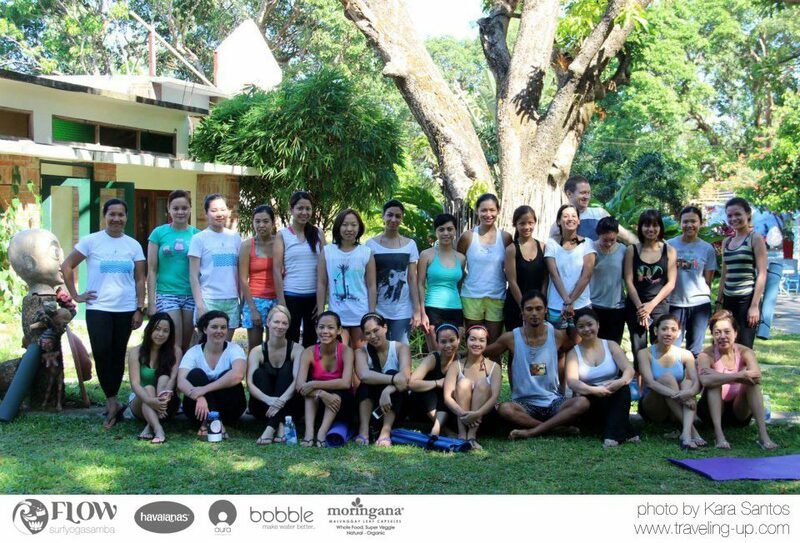 “We’ve been organizing boutique retreats since 2009 and we are glad that many people are finding out about us & truly enjoying our approach to alternative weekend getaways”, says Noelle Hilario, one of the co-founders of FLOW. 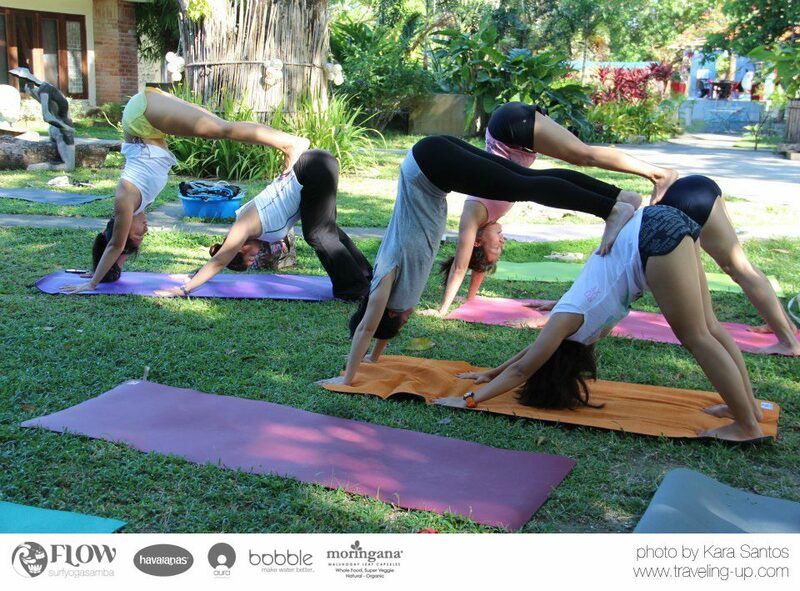 Monica E. Manzano, also one of the partners is a certified yoga teacher. 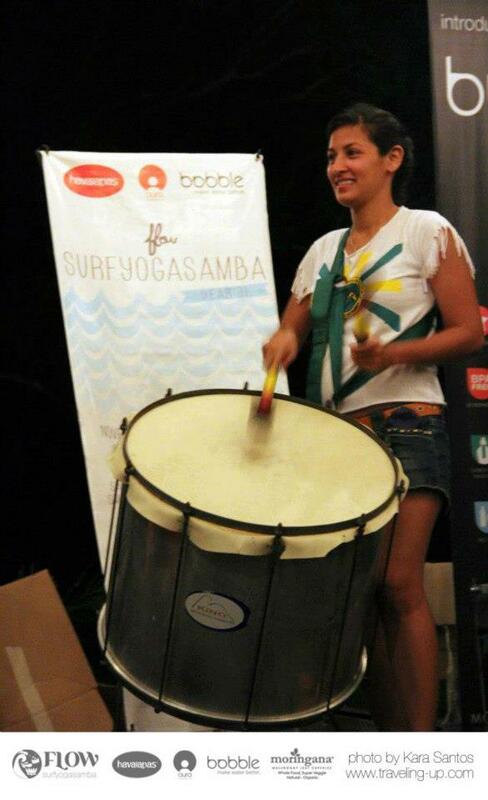 She prefers to practice amidst greens and fresh air. 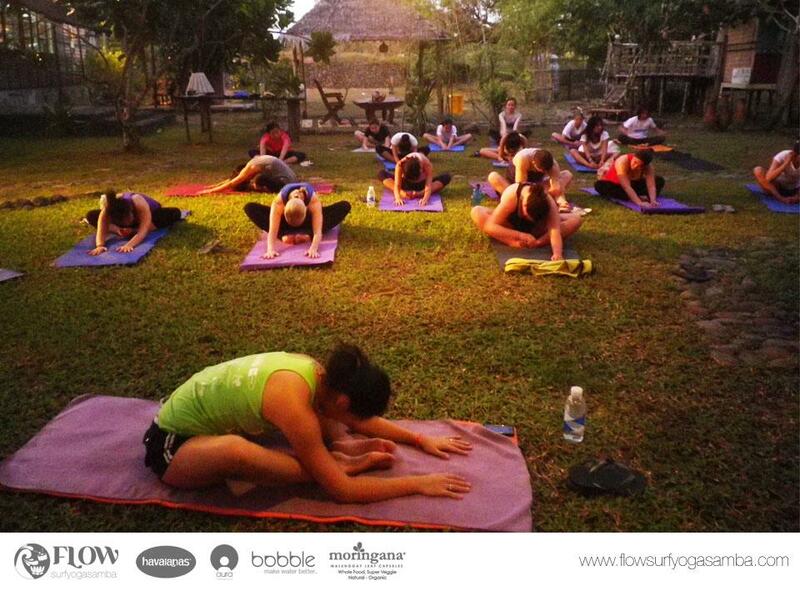 “I used to live in Palawan for 2 years and I feel that you can really heighten your yoga experience by immersing in nature”. 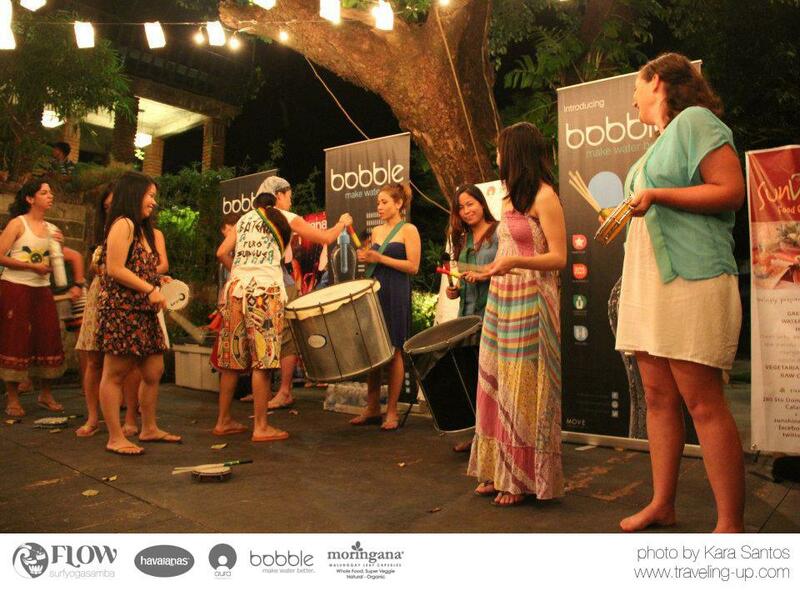 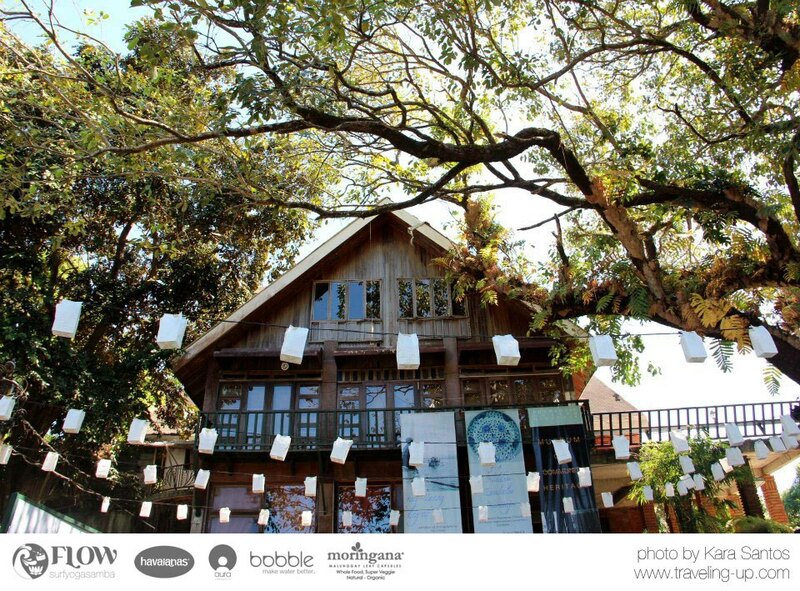 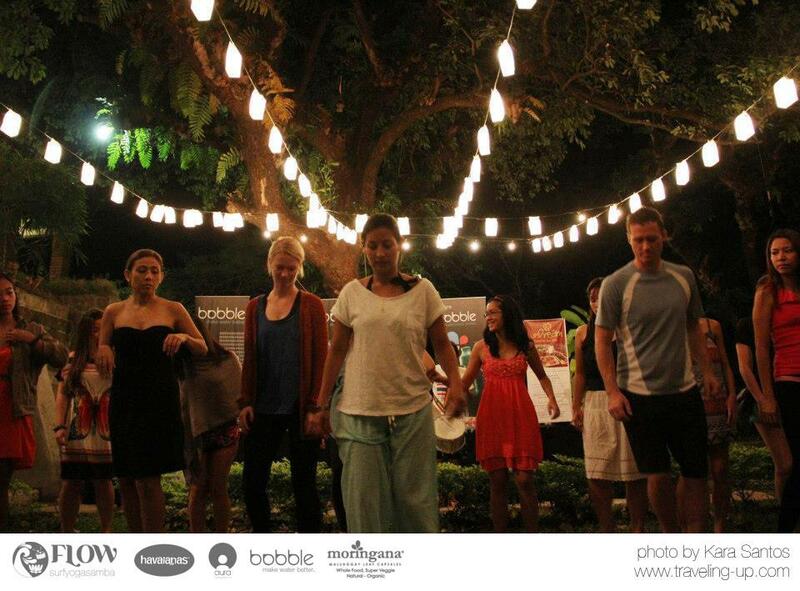 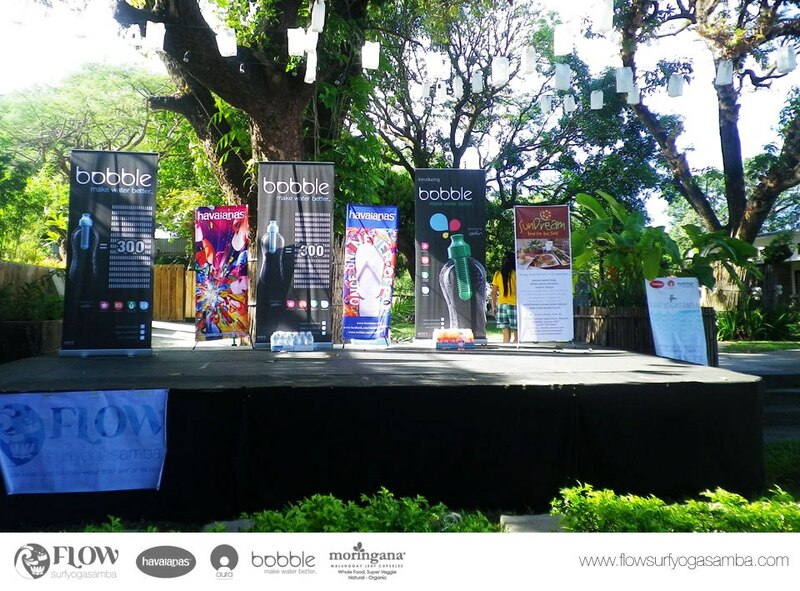 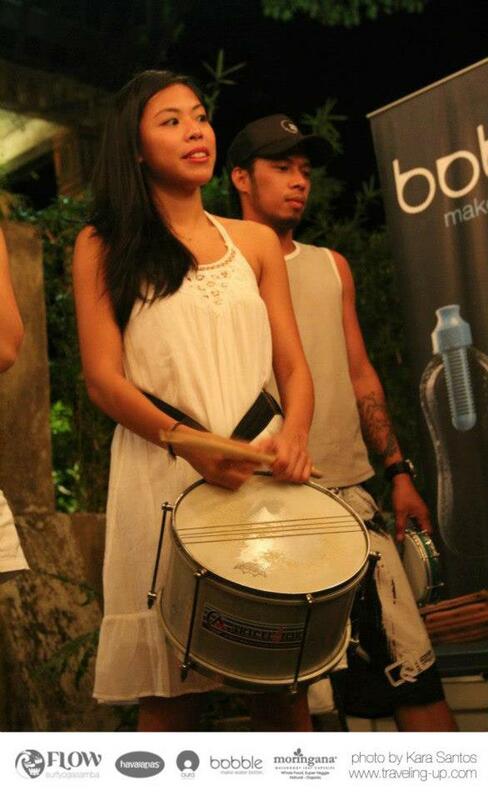 She led a sunset Yin Yoga class in the whimsical garden of artists, Plet Bolipata & Elmer Borlongan. 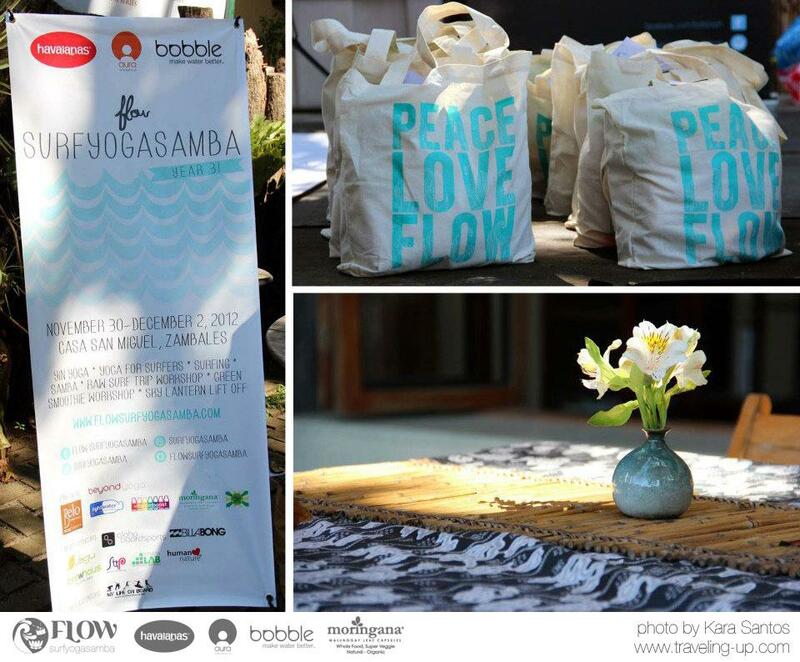 Each participant received an earth-friendly FLOW tote bag filled with sponsored goodies which they used all throughout the weekend. 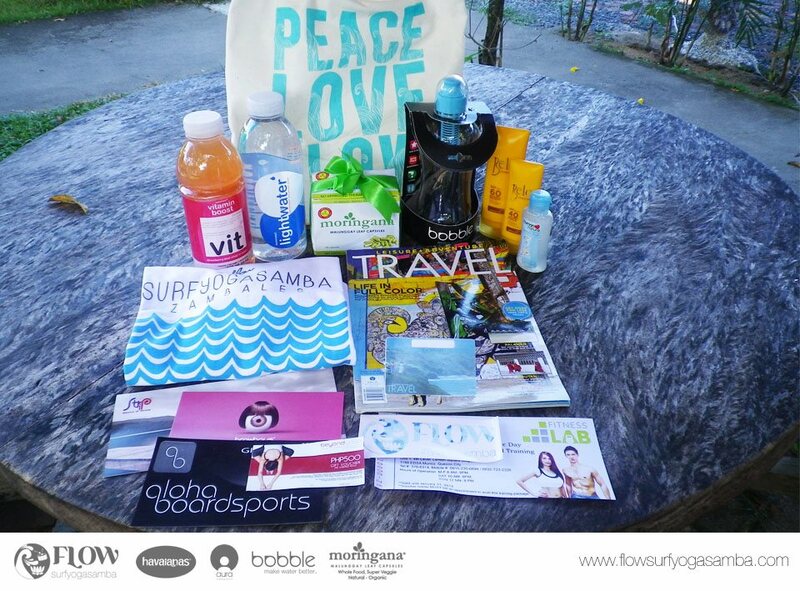 For this retreat, we had Bobble filtered water bottles, healthy doses of Moringana superfood capsules and tea bags, Vitaminboost & Lightwater from Suncoast, face & body sunblock from Belo Essentials Sun Expert, Human Nature feminine wash, Travel Magazines and travel tags, Flow tees plus gcs from Aloha Boardsports, Beyond Yoga, Fitness Lab and Strip & Browhaus. 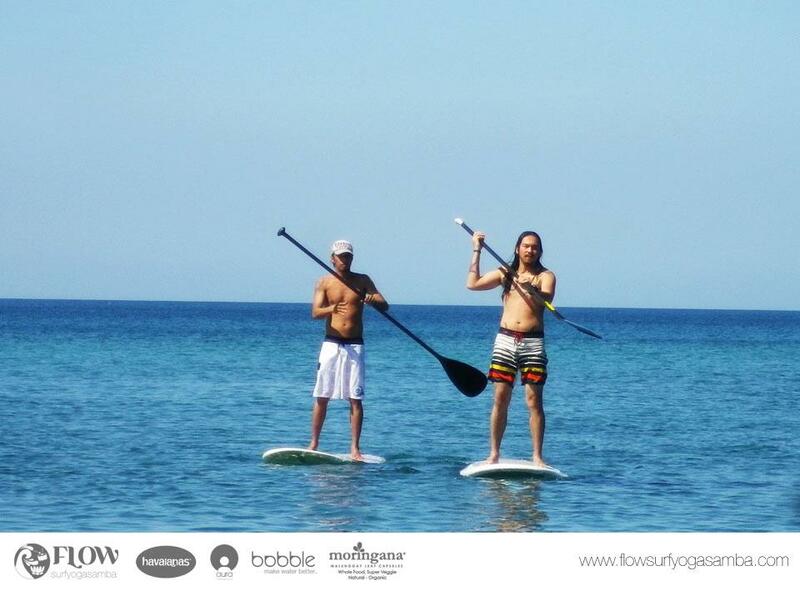 The following day, PETA vegan advocate and Aloha Boardsports team rider, Corey Wills taught a Surf-inspired yoga class which helps build strength needed to paddle out and face the waves. 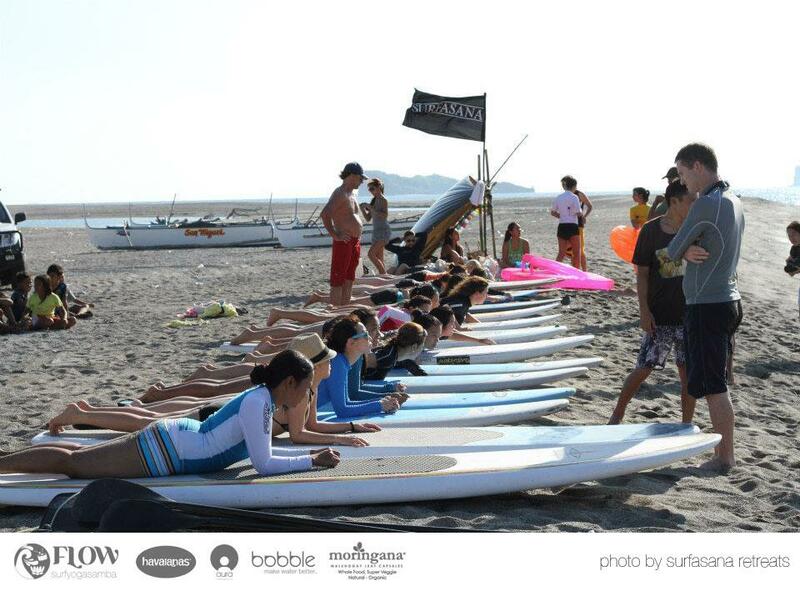 He also taught yoga poses to help loosen tight muscles after surfing. 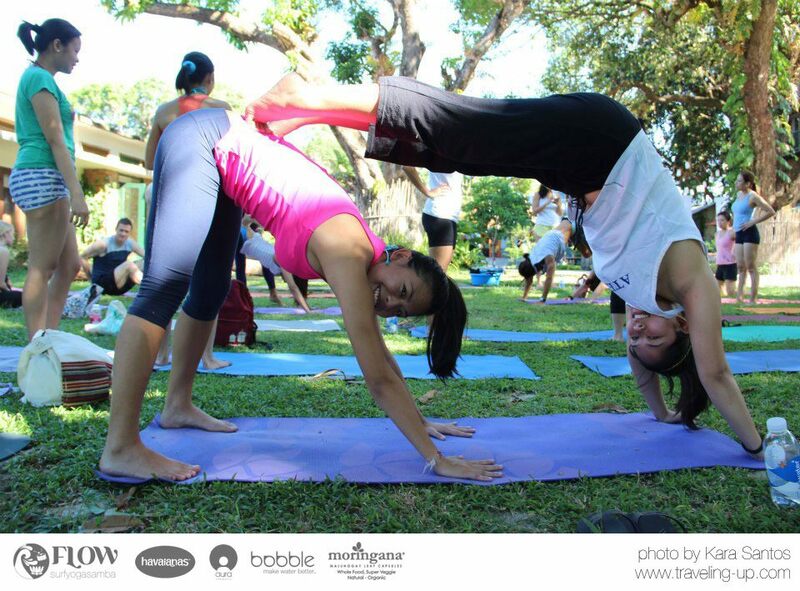 Then some AcroYoga moves to go with the class to lighten up the mood. 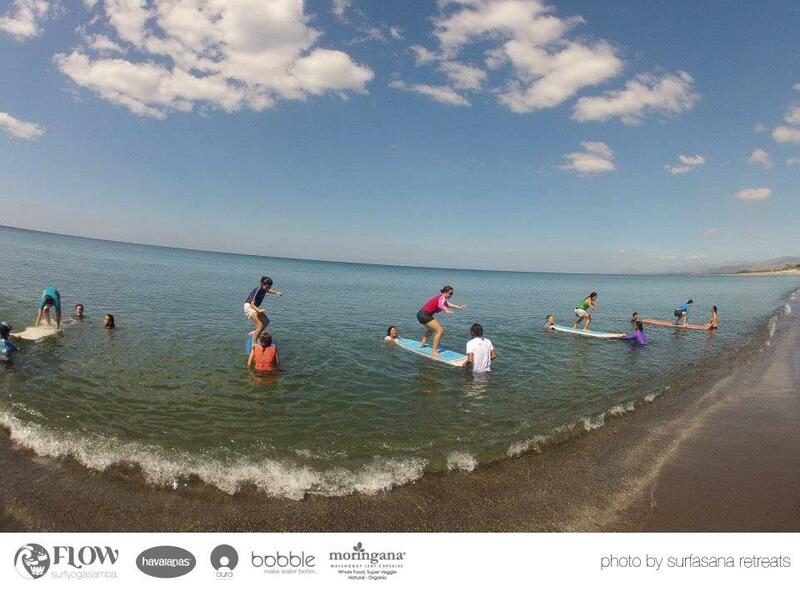 Despite having no waves during the retreat weekend, participants learned ground training and safety skills from the qualified Surfasana team. 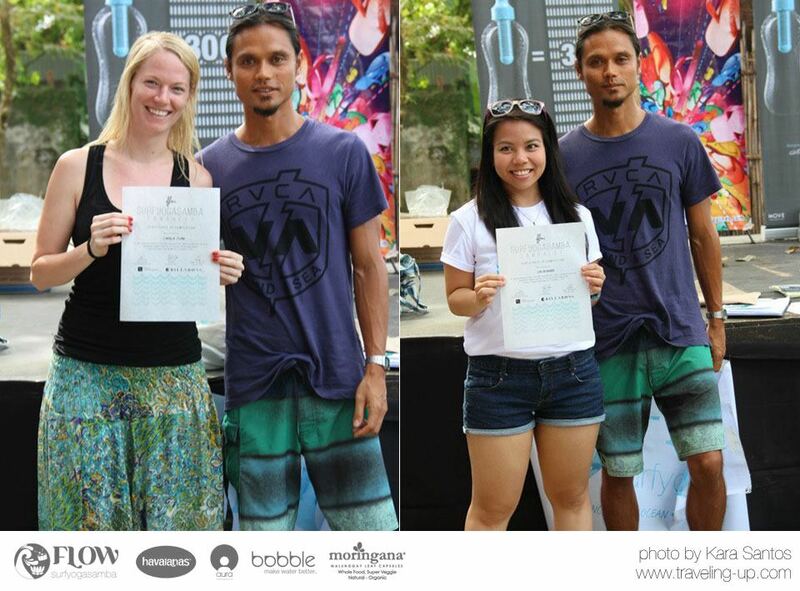 Head coach Nuno Rumao together with Corey Wills, Jessal Ramos, JJ Montelibano & Camille Post Santiago taught with so much heart and enthusiasm. 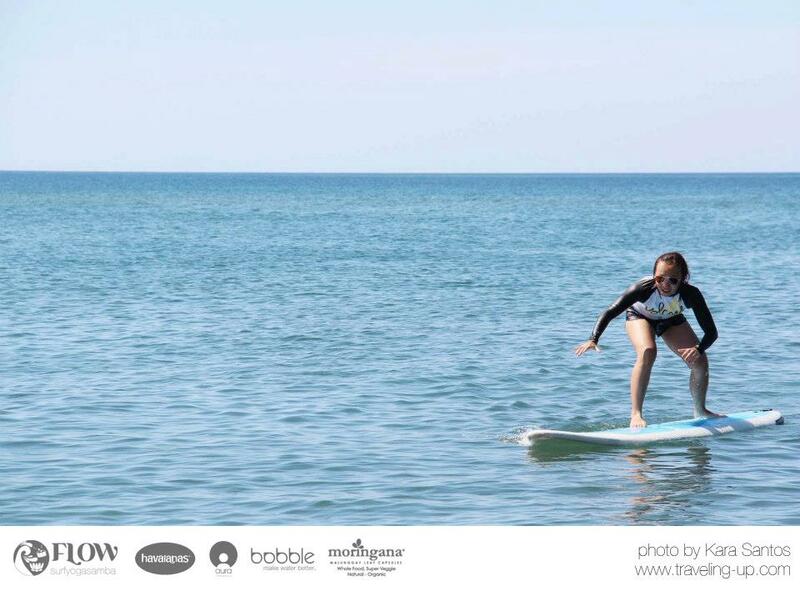 Participants also learned the basics of paddling, “popping up” or getting up on the board, balancing, surf rescue techniques, as well as how to read waves and even water safety. 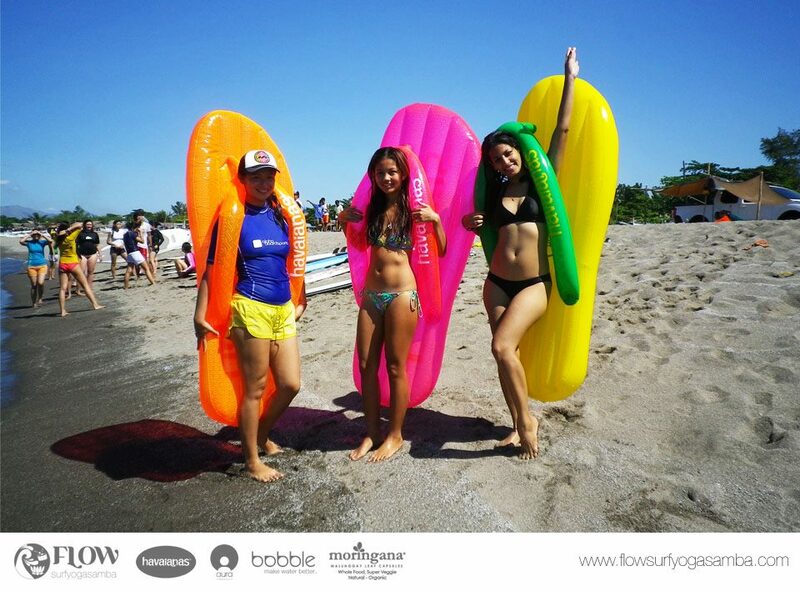 Everyone enjoyed these giant flip flop floaters from Havaianas during downtime at the beach as well as the eco-friendly Bobble water bottles! 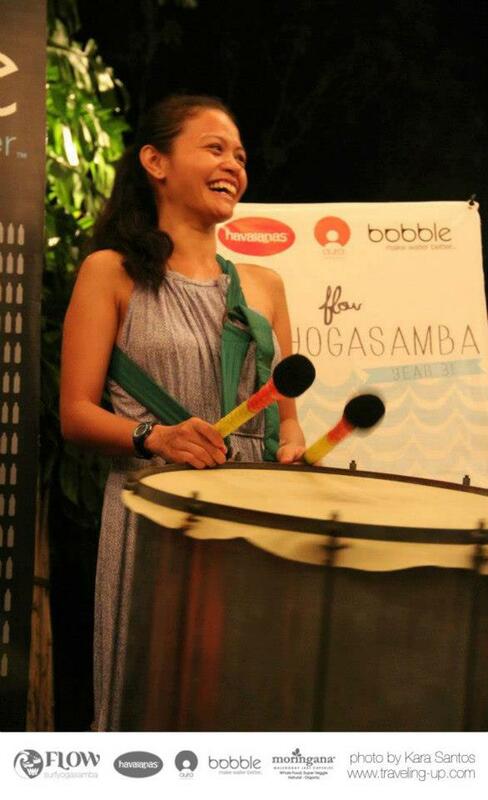 Each night, Toni and Bogey Bernardo of Escola de Samba de Manila would take on the authentic Brasilian batucada beats with Denise Gonzales-Bernardo leading the Samba dance steps for beginners. 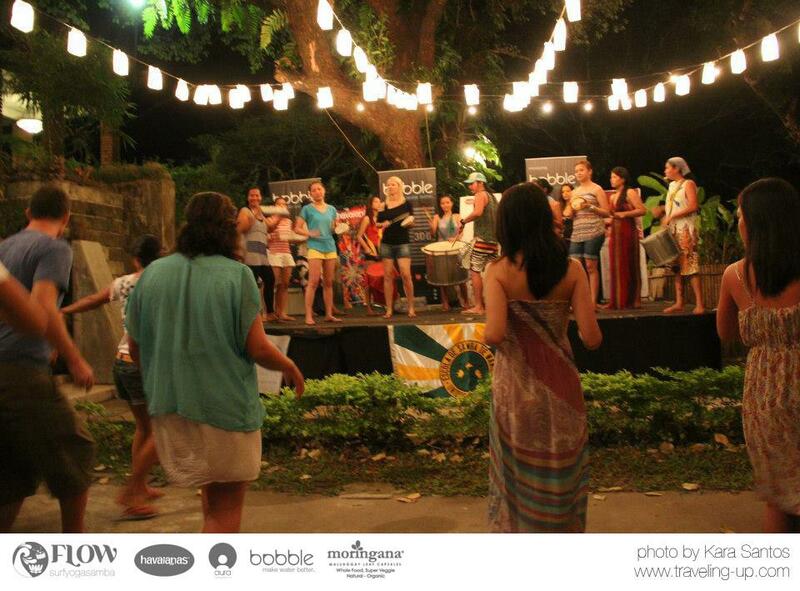 The participants were eager to learn some new dance steps which they used during the culminating evening bonfire at the gardens, while others practiced their music skills with the many percussion instruments and one-on-one instructionals from Toni and Bogey. 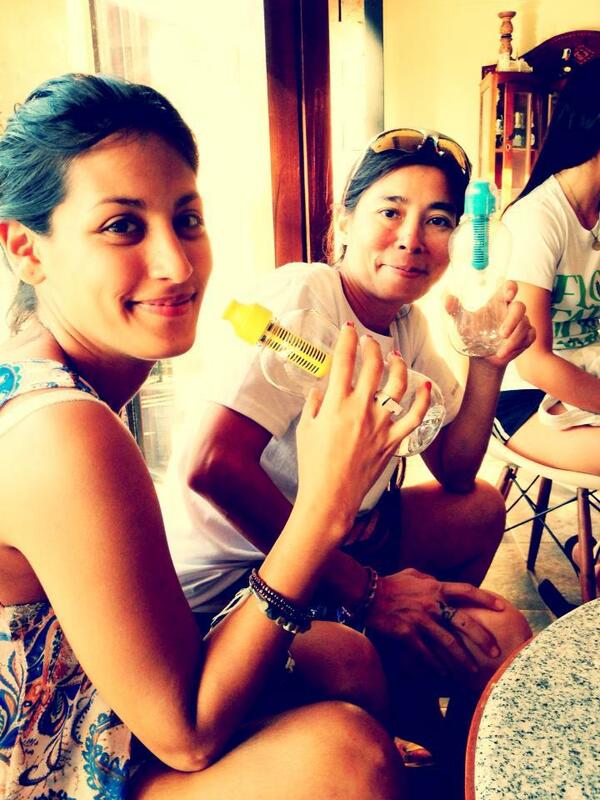 Denise is the third founder of the healthy trinity. 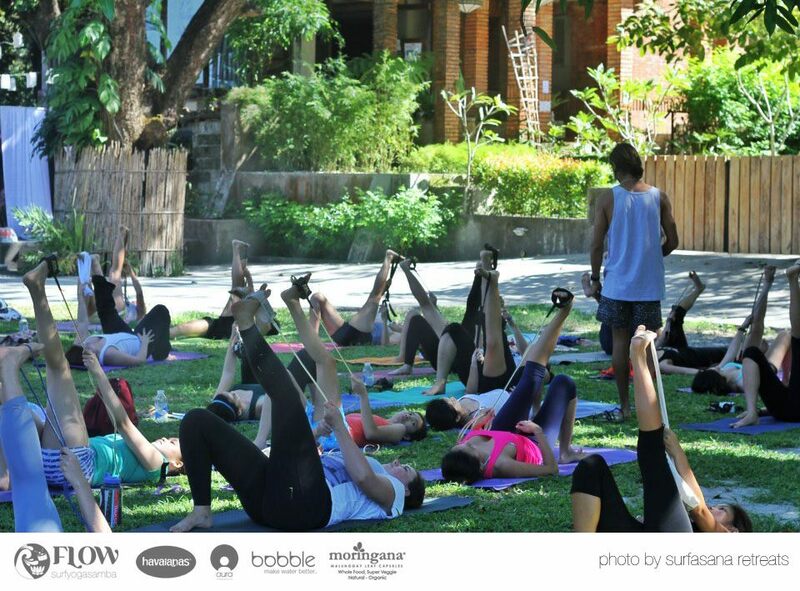 This vegetarian/vegan-friendly retreat will not be complete without emphasis on health. 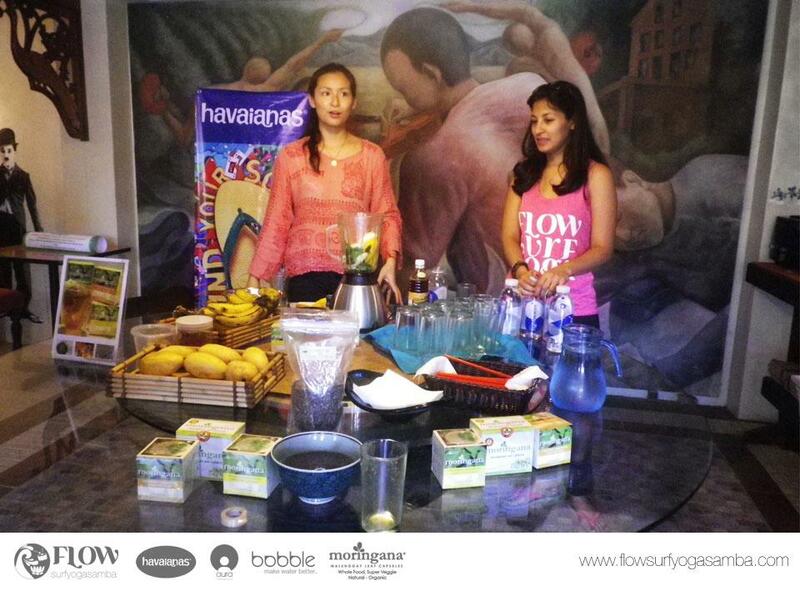 The FLOW girls share the benefits of drinking green smoothies. 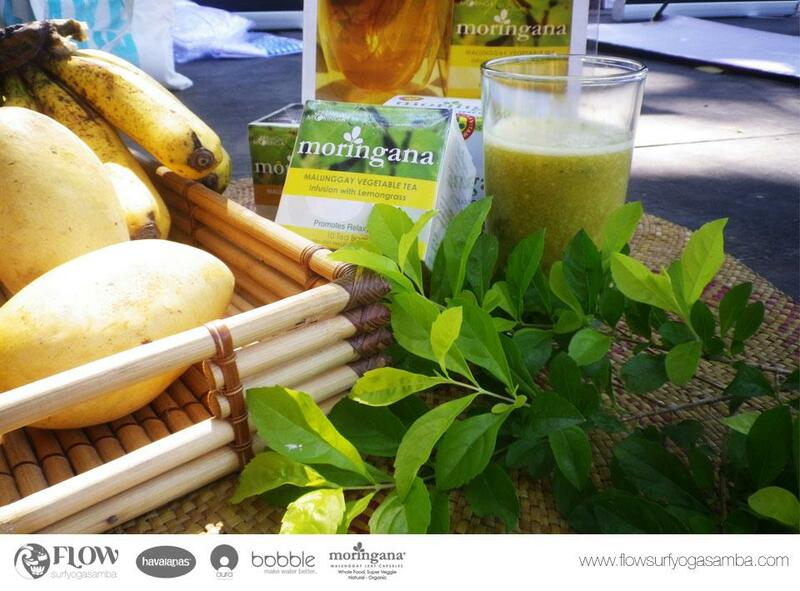 Noelle, Denise and Monica each shared their favorite breakfast-on-the-go smoothie recipes powered by Moringana- whole food Malunggay Capsules made from Pure, Organic Malunggay leaves. 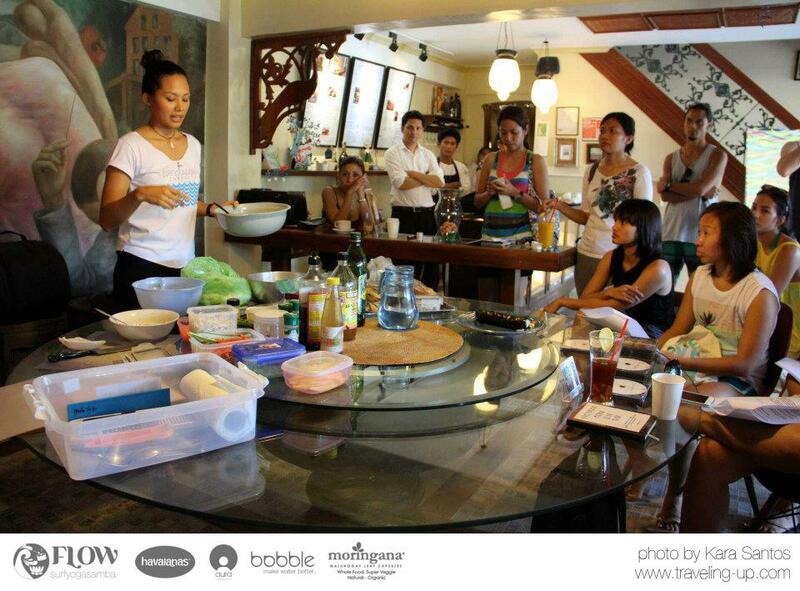 Mona Lisa Neuboeck, a certified raw food chef gave a very enlightening lecture on how to create yummy snacks for any Raw Food Surf Trips. 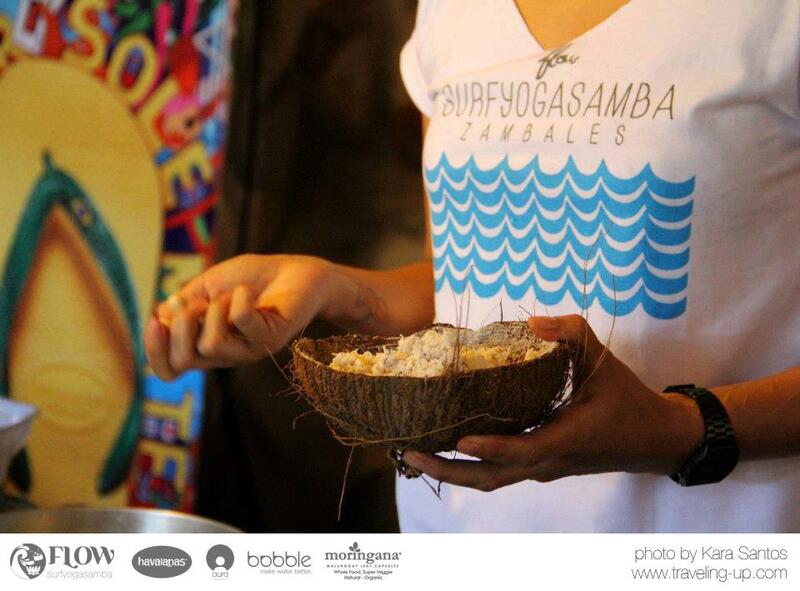 She made raw sushi from coconut meat with vegetables in nori sheets and also taught the group how to make instant raw vegan breakfast porridge perfect for travelers. 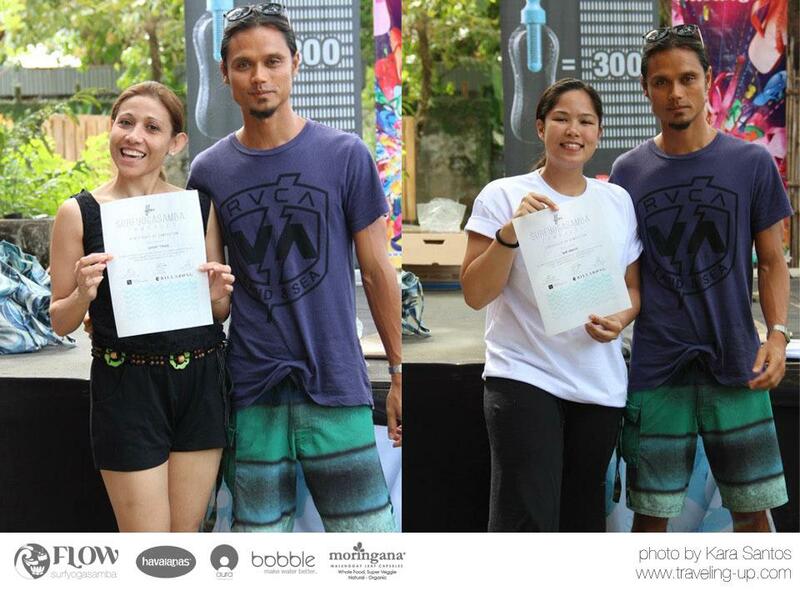 At the last day of the event, everyone gathered for a short closing program where each one received an Aloha Boardsports and Billabong certificate of completion for the surfing classes. 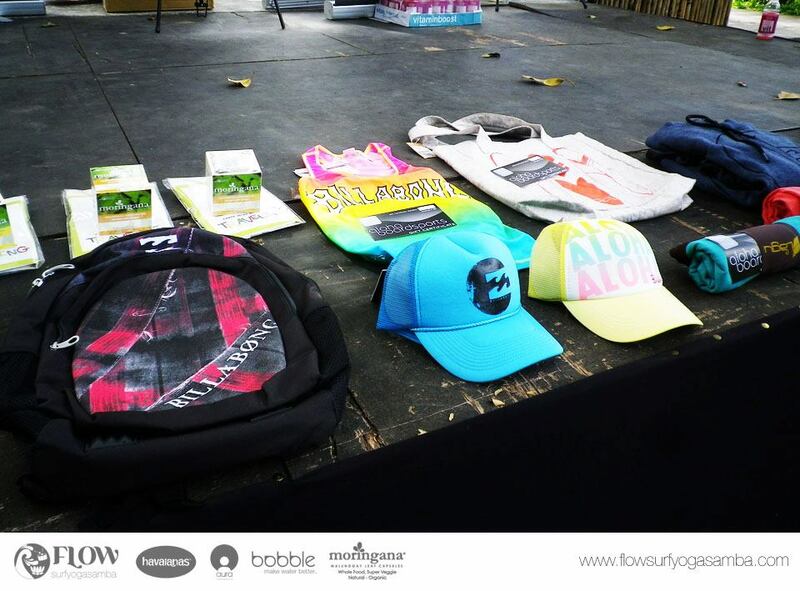 Each participant also went home with a prize but premium items from Havaianas, Billabong and Lagu were given to those who performed well in surfing, yoga and samba classes. 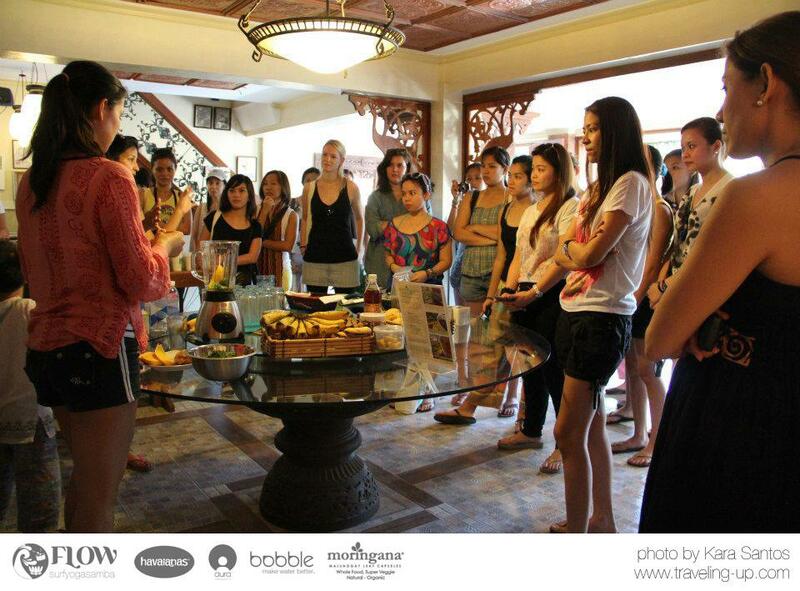 Magazine, When In Manila and My Life on Board.